Between September 20-24, 2015 several social media platforms had unexplained outages. First, on September 20, 2015, was Skype, which had outages in the UK, Australia, and Japan. This was claimed to be due to a software fix that inadvertently inserted a bug. People were listed as being offline, even when this was not the case. Skype service 'restored' after network problems. Skype-owner Microsoft said it had "detected an issue with the status settings" on Skype that show if someone is online or not. The problem locked many people's status as offline - stopping them making calls even though they were connected. Many Skype users in the UK, Australia and Japan have all reported problems. Then on September 22, 2015 Twitter began to have outages, people complaining loudly that they could not get access to Twitter. This again appeared to be a worldwide problem, affecting primarily the US, and the problems returned periodically over the next days and weeks. No explanation was every given. Haven't been able to open app for 2 days! Then FaceBook joined the fray, on September 23, 2015. This seemed to affect the US again, and Europe, primarily. FaceBook blamed a software fix that inadvertently inserted a bug. Early today Facebook was down or unreachable for many of you for approximately 2.5 hours. This is the worst outage we’ve had in over four years. Today we made a change to the persistent copy of a configuration value that was interpreted as invalid. This meant that every single client saw the invalid value and attempted to fix it. Because the fix involves making a query to a cluster of databases, that cluster was quickly overwhelmed by hundreds of thousands of queries a second. 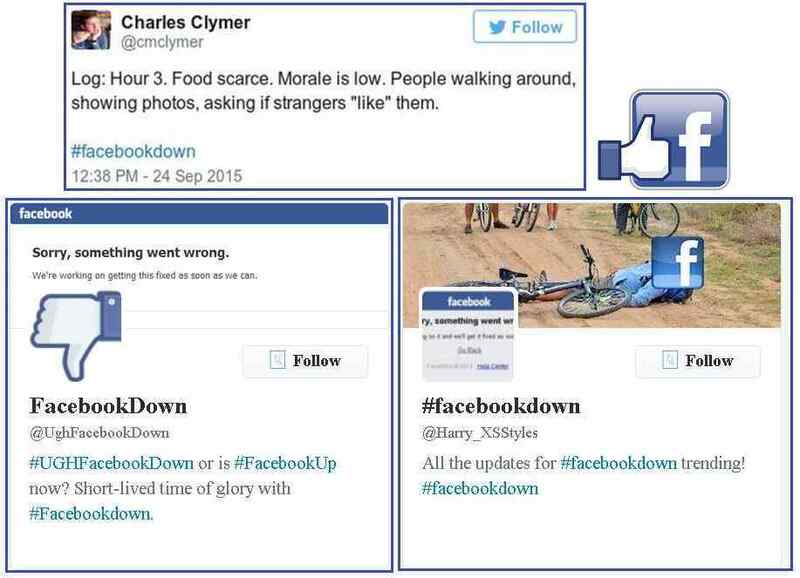 Facebook went down for 13 minutes today. Facebook went down from roughly 12:34pm to 12:47pm ET today for editors of Conservative Intel. The problem was across the United States with emphasis on both coasts as well as significant problems in Europe. Problems at FacebookFacebook is having issues since 7:31 AM EDT. Are you also affected? Leave a message in the comments. Per Zetas, these outages are not what they might seem on the face. On the face it looks like an attempt to take down social media to prevent the announcement from spreading. This had been the approach of the cover-up crowd in the past, to block access. ZetaTalk Insight 0/3/2015: The three major social media outlets in use around the globe all had significant, and simultaneous outages between September 20-24, 2015. Skype had complaints from the UK, Australia, and Japan. 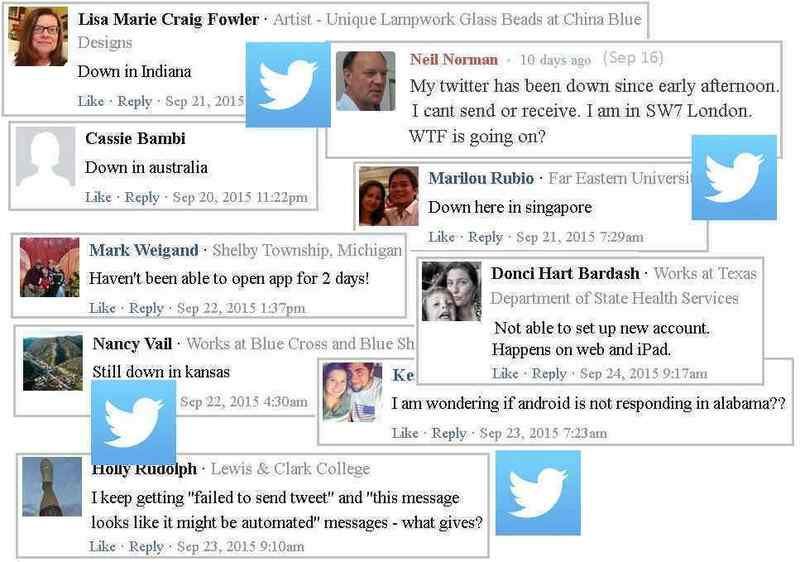 Twitter received reports from the US, Australia, and Singapore. FaceBook had the loudest howls, primarily from the US and Europe. Notably these downtimes, some lasting for hours or even days, got no attention in the major media, and there was no real explanation for the outages. The outages were not announced as downtime for system updates. No electro-magnetic pulse (EMP) was evident at this time. What happened? Skype is owned by MicroSoft, FaceBook is a public company but founder Zuckerberg retains over 20% control, and Twitter is also a public company with almost 50% held by institutional portfolio management. Unlike major media, whose ownership is most often tightly controlled by conservative members of the elite, the social media is viewed as chatter on the Internet outside of establishment control. Were these sites hacked, in an effort to stop the Internet ahead of a possible announcement during the week of September 23-28 by the Pope, Obama, Xi, and Putin? In the past, announcement attempts were blocked by cutting Emergency Broadcast System wires or shutting off a TV broadcast by the 30 second delay mechanism or confusing TV stations with false court orders. The announcement might be made, but only those present in the room would be aware of it, and could be threatened. Then a story that Obama had suffered a mental breakdown would quickly be spread. But in a broad audience such as the crowds flocking to see the Pope or in attendance at the UN, there would be too many witnesses. Social media itself would have to be stifled, the news purged, while an alternate story was promulgated. Per the Zetas, there is an entirely different reason for the social media outages – to enhance the announcement when it happens. ZetaTalk Insight 0/3/2015: It is notable that the outages affected primarily Western countries – the US, the Queens Commonwealth countries, Europe, and Japan. If one assumes that the outage was to test the ability to take down social media in these countries to limit the impact of the announcement, this could hardly prevent the rest of the world from learning of it and chattering away on the Internet. It would be a delay only, and one that would raise immense suspicion of the governing powers in those countries, thus generating social unrest. Thus logically the downtime on social media was not to prevent chatter after an announcement had been made. So what was the agenda, the reason for the outage? The cover-up crowd, those elite reluctant to have the public informed, reside primarily in the US, the UK and its Commonwealth, and Europe. The leadership of Russia and China are on board with the announcement, as they want to move their populace to safer ground. Indonesia and Japan fear the announcement as their countries will be impacted by the plate movements predicted by ourselves, the Zetas. Thus Singapore and Japan were included in the outages. Lies about the announcement will promptly be spread in these countries. So the intent of the downtime on social media in these countries was not to block announcement chatter but to facilitate it. Every Skype user has an account and a password, as do their contacts. Every Skype user can broadcast messages to their contacts, even if these contacts are not presently online. Every twitter use likewise has an account and a password, and by sending a tweet passes information along to subscribers, who can retweet the info in the future. FaceBook users likewise have an account and a password, with many friends who pick up info from each other and pass it along on their FaceBook accounts. In all of this, the networks themselves are aware of the accounts and passwords, and could do a broadcast to all in the event of an announcement. Check your user agreements. This is legal! 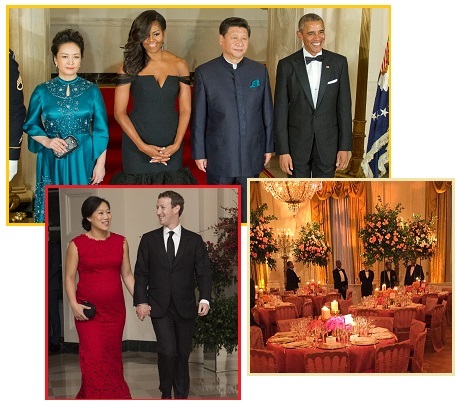 Could these tech CEOs, recently at a State Dinner for China’s President Xi, be on the announcement team? A high-wattage collection of Hollywood studio chiefs and technology big-wigs convened at the White House Friday for a state dinner in honor of Chinese President Xi Jinping. The White House invited marquee names from Silicon Valley, including Apple CEO Tim Cook and Facebook founder Mark Zuckerberg, to sit at the dinner's head table alongside President Barack Obama and President Xi. In 1995, at the start of the ZetaTalk saga, the Zetas were asked about Mars, whether it had once or does now hold life. The Zetas went on record stating that Mars indeed had developed primitive life to the extent of supporting moss and bugs and worms, and had indeed held water sufficient to sustain an atmosphere. But the Annunaki sent the water underground while washing their Gold, and thus the atmosphere thinned to the point where the Annunaki could no longer live on its surface. 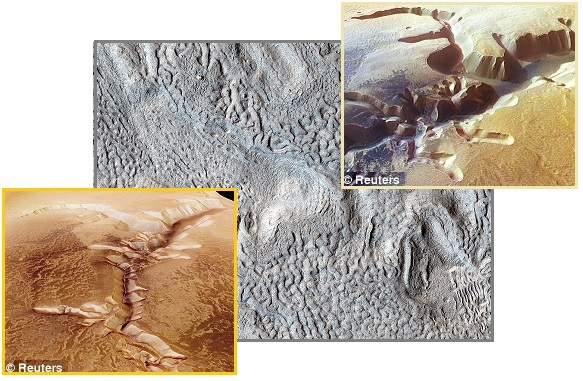 Reluctant to acknowledge that the Zetas were right, NASA stalled, but finally NASA and the ESA admitted water on Mars in 2008, providing images of water washed gullies. Then increasingly NASA provided not only proof of water on Mars, but signs of the Annunaki on Mars in the past. In 2008 the NASA rover images also revealed an obvious stick of wood. By 2011 NASA was admitting that water on Mars occurred “in the past”, adopting the ZetaTalk explanation that the water had been run underground. 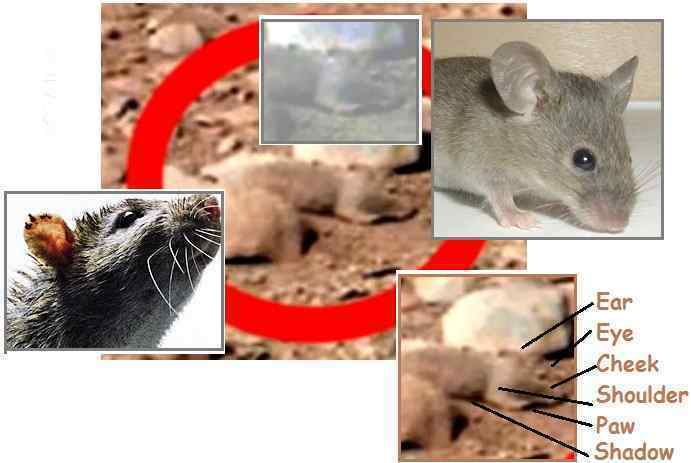 By 2012 the Mars rover images released showed a mouse on the run and the skull of a sheep or goat. 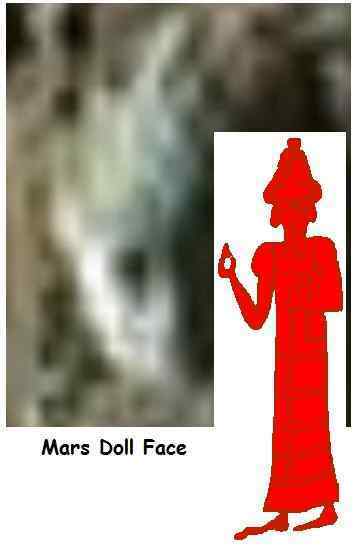 In 2012 the Mars rover images released even revealed evidence of the Annunaki on Mars in the past – a toy doll with Annunaki head dress. By 2013 the rover images revealed desert hawks and gold dust on the sleuth paths used by the Annunaki in the past. And in 2014 major media was abuzz about a rock on Mars that apparently moved between photo shots. Per the Zetas, this was a mouse nest that had been dropped by a hawk. Then in 2015 we had an atmosphere plume in the media and now, scientific proof that Mars has vast seas, as large as the Arctic Ocean. Now, amid much drumroll and suspense, NASA is admitting that fresh water flows over the surface of Mars! New findings from NASA's Mars Reconnaissance Orbiter (MRO) provide the strongest evidence yet that liquid water flows intermittently on present-day Mars. Using an imaging spectrometer on MRO, researchers detected signatures of hydrated minerals on slopes where mysterious streaks are seen on the Red Planet. These darkish streaks appear to ebb and flow over time. They darken and appear to flow down steep slopes during warm seasons, and then fade in cooler seasons. They appear in several locations on Mars when temperatures are above minus 10 degrees Fahrenheit (minus 23 Celsius), and disappear at colder times. The new findings of hydrated salts on the slopes point to what that relationship may be to these dark features. The hydrated salts would lower the freezing point of a liquid brine, just as salt on roads here on Earth causes ice and snow to melt more rapidly. Scientists say it’s likely a shallow subsurface flow, with enough water wicking to the surface to explain the darkening. Thanks to its carved topography, researchers have always suspected that Mars was once home to several rivers, lakes, and perhaps even oceans. There has even been some speculation about the existence of frozen water deep beneath the ground. However, finding evidence of liquid water in the present day, has been a little elusive. That is why NASA's September 28th announcement that confirmed the detection of liquid brine on the Red Planet caused so much excitement. NASA says it has big news for us Monday. "Mars Mystery Solved," the agency's news release touts without offering even a hint as to what mystery they mean. For those who just can't wait, a little Googling may solve the puzzle - and it's not Matt Damon, little green people, or any other clear indication of life. It appears to be a confirmation of periodically flowing water on the planet's surface. Three of the scientists slated for the news conference are listed as authors of a new paper to be delivered at this week's European Planetary Science Congress. Has NASA gone into the entertainment business? Following the drum roll announcement on water on Mars we had a NASA light show along the East Coast in the news. Flash! Tune in to NASA for the latest drama! The NASA Light Show is part of the MMS project to measure the Earth’s magnetosphere. 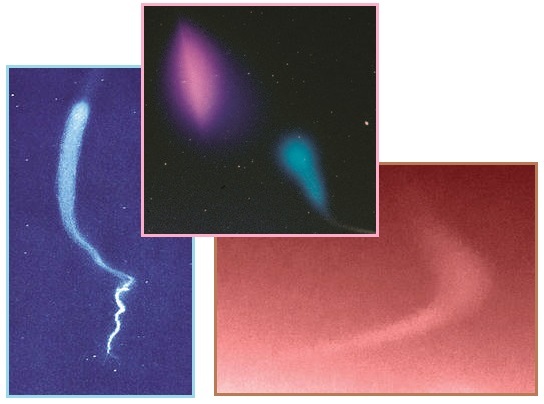 NASA says it’s ejecting four different payloads of a mix of barium and strontium, creating “a cloud with a mixture of blue-green and red color.” Here’s an example of a barium release provided by @NASA; you can see the barium’s “ionized component, which has become elongated along the Earth’s magnetic field lines.” And here’s another tracer shot from a launch using lithium vapor and trimethyl aluminum over the Marshall Islands. First used with sounding rockets flown in the 1950’s, scientific research with experiments which inject vapor tracers in the upper atmosphere have greatly aided our understanding of our planet’s near-space environment. 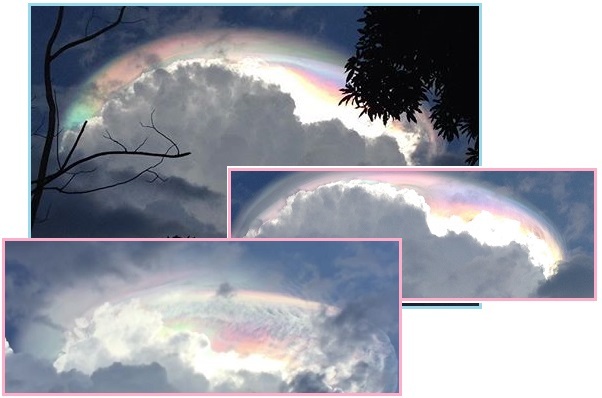 This follows prior light shows that got media attention, the Costa Rica “End of Times” rainbow display, detailed in Issue 470 of this newsletter. Signs in the skies have indeed become an issue of concern. Per the Zetas, the drum roll on the light show to take place on the East Coast was to give the impression that these lights in the skies are normal, and even that they are manmade. 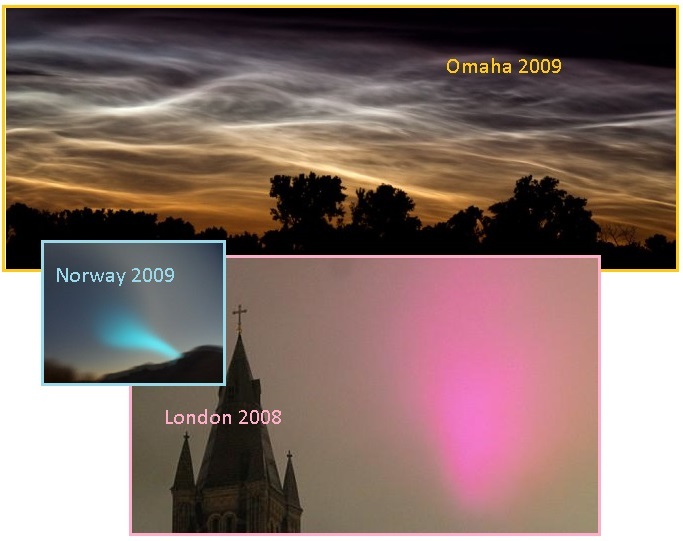 Of course we have also had neon clouds galore lately due to the grease in the tail of Nibiru, aka Planet X, and these neon clouds come in these same colors. None of this is a coincidence, and the public should get used to this type of polarized news – yes it is true, no it is not true. For every evidence of Nibiru that hits the media, there will be comfort news for those who would be driven insane or into drastic action out of fear. The Element of Doubt principle, instituted by the Council of Worlds, which has worked so well in getting the populace accustomed to the idea of the alien presence gradually, adopted by Obama and NASA. Indeed, the NASA induced light show, the tracers to measure the Earth’s magnetosphere, do look similar to the neon clouds that have appeared since Nibiru, aka Planet X came into the inner solar system. These are NOT the upper atmosphere tracers launched by NASA. Nor was the dramatic Norway swirl in 2009 caused by NASA tracers. But the public is to be confused, and when noting the increased signs in the skies caused by the greasy tail of Nibiru wafting the Earth think that perhaps it is all just the NASA light shows.